Latest TV and Radio Schedules are Here. "TRUCKING FOR A MIRACLE-WORKING GOD, Volume 1"
This book is dedicated to my wife, Blonnie and my son, Orville. I was born in Buckingham County, Virginia, on July 7, 1937. I had a wonderful mom and dad. My sister was born seventeen months later. My family enjoyed a lot of things that were not available to a lot of people in our country. You could raise a garden, keep a milk cow, raise hogs, hunt and fish and play and do most anything you wanted to do. We were blessed of God even though my family didn't worhsip God. I was taught right from wrong and to love and respect all people. My mom and dad both worked hard and expected us to work with them. We had very good neighbors. Our neighbors all got along very well, both black and white. I still love them all very much. A the age of twelve, I got spinal miningitis. I was not expected to live, but God reached down and healed me. I am now sixty years old and enjoy good health, divine health like Moses. I praise God daily for healing me. I praise HIM for my family and for my childhood home in Buckingham County, Virginia. I always praise God and try to remember GOD IS FAITHFUL. God is surely a MIRACLE-WORKING GOD. In April of 1945, Mamma and Daddy, my little sister and I were planting potatoes in our garden. It was a beautiful day, and at the time, I believe, I was despondent about having to help. But Daddy wasn't impressed with my attitude. I should have been enjoying the beautiful day and the fact that I had been blessed with a mom and dad that loved me. When we finished planting potatoes, it was my job to gather up the tools and put them away. As I walked up near the edge of the woods, it was almost dark. God spoke out loud to me. At first I was afraid to tell Daddy. Mom and my sister had gone to fix our supper. I finally got up enough courage to tell my dad. Daddy sometimes had a very high temper, but when I told Daddy that God had spoke to me, he just replied, "I know, because I heard Him too." Daddy said he wanted me to go to church. A few days later, I was blessed to attend a revival at Mt. Tabor Baptist Church where I heard the word of God. I wanted to accept Jesus as my "Savior," but the devil said,"Sit back down." He spoke through my Mom as she was not saved at that time. She said she wanted my sister and me to wait until we were old enough to know what we were doing. So I began to lose interest and to run from God. I ran from God, and I was in the world and of the world. I was as wild and as untamed as the wind until I was twenty-eight years old. I ran and ran and ran, but I could never forget the voice of God. When I was twenty-eight, the Lord sent a stranger to my door. At the time I was a welder in the shipyard in New Port News, Virginia. This stranger told me about Jesus. I accepted Jesus as my own personal "Savior." God completely changed my life! Praise His wonderful Name forever! Now I'm free at last! You can also have the freedom and abundant life that comes when you receive Jesus as your "Savior." When God saved my soul, it was just like God said in the Bible in Second Corinthians 5:17. He said, "If a man be in Christ..." He talked about being a new creature, about old things passing away and all things becoming new. When Jesus came into my heart, He delivered me from strong drink, and my head began to clear up. Jesus delivered me from "cussing" and talking ugly. He began to give me a sense of credibility. He delivered me from tobacco, and I began to feel better. God began to deal with me about attending church. I started watching a preacher who was the pastor of a church down the street in Hampton, Virginia. I decided to stop and talk to him. He and two deacons were standing in the church yard talking. I pulled up and got out of my car. I walked up and told the pastor about accepting Jesus as my personal "Savior." I told him that I was going to start church. and I also declared that I wanted a job. The pastor was not impressed. He pointed down to the ground and said, "This will be your job." I said, "What job?" He said, "Picking up paper on the church yard." I was offended. I ran and jumped into the car and took off. Blonnie spoke up. She said, "What's wrong honey?" I said, "He tried to give me a job picking up paper on the church yard." She said, "That wasn't the pastor giving you that job. It was God." She said, "Go back and I'll help you." My wife and I still have that job today, picking up paper, cutting grass, painting or doing whatever it takes to preach the Gospel of Jesus. This church and place was a wonderful time of teaching and testing and blessings. It is also the place I received my call to preach the Word of God. Thirty-one years later, it's still just as real, and Jesus is still just as real; and Jesus is still teaching my wife and me every day as we Truck for Jesus! More Training - God Starts a New Work! 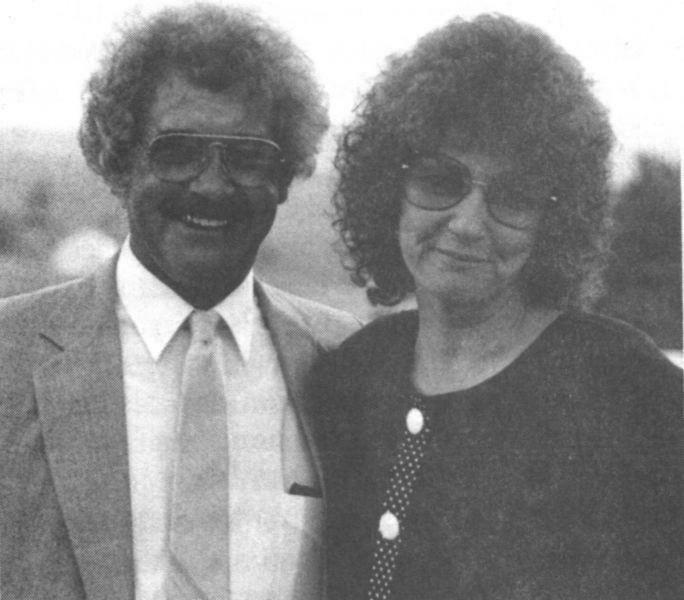 When we left the church near Wyth Fire Station in Hampton, Virginia, we had served as assistant pastor under Pastor Lewis Riley for two and one-half years. It was a wonderful time of learning to put our trust in God, to walk by faith and not by sight. As we continued to walk with God and serve Him with all our hearts, God began to deal with Blonnie, my wife, and me about going out to Fox Hill, a section of Hampton, Virginia, near Buckrow Beach, to start a new church. God led us to a building at 220 Beech Road in Fox Hill, Virginia. God allowed us to rent the building and fix it up as a place of worship. We got everything ready and began to preach the Word of God. God began to save souls. It was a glorious place, and the Lord began to pour out his blessings. God began to bring in special people. Some are still serving the Lord today. The Word of God will not come back void! It will accomplish what God sent it out to accomplish!! God opened doors all over the country while we were at the Hampton church: tents, nursing homes, jails, radio and T.V. All praise and glory be to Jesus! We were blessed to stay at 220 Beech Road for five and one half years. Those were great and glorious years and also years of more training for the mission the Lord had called us to. God had been dealing with us about going out on the highways of Canada and the U.S.A. to preach Jesus to the truck drivers. After much prayer and fasting, we decided to quit making excuses and go where God was leading us. It was a hard decision, but we were not alone. God began to show us what to do. When God is showing you, it will work out just fine. We were now ready to go to the road for Jesus! 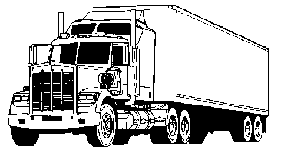 We made our contacts with a trucking ministry, an organization. At first, the answer was "no" because a husband and wife team had never been sent out. And besides, we had a son, eight years old. After being turned down, we continued to pray about the Will of God. After a few weeks later, we got a letter from the president of the organization saying the Lord had been dealing with his heart, and we had been accepted to go on the road. He said, "What I like about you -- you are not dignified; you are not smooth, and you are not what we had in mind --but you got guts!" What a compliment! We quit our job in the shipyard. We sold our home and our belongings and the stuff that we were attached to. We enrolled our little boy in the Calvert School for Missionaries' Children. God sent another pastor to the church, and we were now ready to Truck for Jesus! We started out on the road with the organization preaching across Canada and California. It was a grand time of blessings. We saw God save souls and work miracles. The devil got very made! The organization began to find fault with us. I took the tractor and trailer back to Santa Cruz, California, and we were badly misused, insulted, and dismissed. We started back across the U.S.A. very disappointed, discouraged and humiliated, because the organization had been both dishonest and unfaithful to God and to me and my family. But God Is Faithful! In spite of what people were trying to do, God was still not through with us on the road. We were led of the Lord to go to Greenville, South Carolina. We know it was God leading us every step of the way. We were able to trade our pickup for a big straight truck, like a U-Haul. We planned to convert it to a mobile chapel. After much work and several months of prayers, the chapel was completed, and we were ready to go preaching at the truck stops across America. 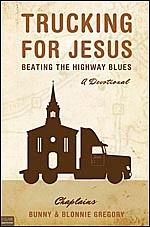 We called it "Trucking For Jesus." By then it was 1975. Our first truck stop, as we began to Truck for Jesus, was at Anderson, South Carolina. God gave us favor with the owner, and we had a good stay, as we played music and preached the glorious Gospel of Jesus. On the road, life is very demanding. You must be completely sold out for our "Savior." After our first truck stop, it was a trip to truck stops all across the U.S.A. We stay at each truck stop for a week at a time. God is doing a lot of wonderful things. People are being saved. People are being healed. Drivers are being delivered from the curse of drugs, alcohol and every kind of addiction. God is always faithful. Our "Savior" blessed us to meet good people everywhere we go. A lot of the people the Lord brings to us know about Jesus, but have never received Him as "Savior" and Lord. 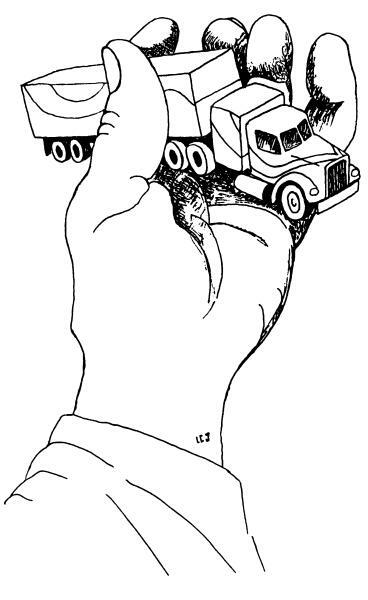 Some of the truck drivers have already had a real experience with Jesus, but are cold and indifferent toward God. The Lord is not willing that any man should perish, but wants them to come to repentance. There is still hope for the lost and the backslidden. We all need JESUS - every driver. The people that work around truck stops; the people that listen by way of radio and T.V. Doctors need Jesus. Firemen need Jesus. Fishermen need Jesus. Lawyers need Jesus. We ALL need Jesus. This is the message we preach when we are on the road Trucking For Jesus. I urge you to get right with God. Jesus is the way, the truth and the life. (John 14:6) Please accept Him as your own personal "Savior." Today is the day of Salvation. God doesn't promise any of us tomorrow. As we go into the truck stops, we see God moving and working all types of miracles: spiritual, physical and financial. (Psalm 103:3) God still cleans our lives up. He still saves souls, heals and makes us whole. God still delivers. God is not a man that he should lie. It's good to trust God for our protection because He is well able. God also has keeping power. He is able because He is not only the author, but the finisher of our faith. In the eastern part of Virginia, we had service in a community center. A deaf boy that could not speak was brought in for prayer as he had never been able to hear or speak. We anointed him with oil in Jesus' Name. As we prayed, God healed his ears and he began to hear. God touched his tongue, and he began to speak. God is Faithful, and able to supply, or do, and will give us the solution to any problem. God is surely a miracle-working God. The good Lord will surely bless us if we let Him! I needed a new pair of pants. We were ministering in the truck stop at Barstow, California. We prayed and the next morning on the ground, right next to our trailor, we found a new pair of pants on a hanger. Perfect fit. To God be the glory! It sure was a miracle. I serve a MIRACLE-WORKING GOD! If you will prove God, this day you can see the windows of Heaven open, and God will pour HIs blessings out on you. In fact, you won't have room enough to contain them. (Malachi 3:10) Put your trust in God today! Praise Him! At Abilene, Texas, on a Sunday, it was church as usual on the Mobile Chapel. God blessed at the West-To-Go Truck Stop. We were having one service after another. As one of our services was being dismissed, and everybody was saying "goodbye" a man leaning against a car walked up and said, "I've been listening out here." He said he had really enjoyed the service and wanted to go and get his wife and children for our next service. As our next service started, in came the young man, his wife and two children. The chapel filled to capacity, and the Lord blessed every part of the service. It was wonderful. The Lord saved souls and our hearts were lifted as we praised and worshiped God that day. Later that night, in our last service, the young man, his wife and children came back and some more drivers and their families came in. After the invitation to accept Jesus was given, the young man's wife stood to her feet and asked if we would go pray for her daddy the next morning at day light. As I started to say "no," because I had to be in Fort Worth, Texas the next day, I asked instead what was wrong with him. She said, "He is blind." I said immediately, "Yes, if you come and give us a ride, we will go and have service in his home." We got to the home at Bierd, Texas, right after daylight. The home was full of people. They received us with joy. We preached a message "Looking Up To God and Seeing All Things Clearly." We prayed and played music. As I gave the invitation to depend on Jesus, nobody made a move. The man was blind and so was his wife. I prayed for his wife, and the devil lied and said, "Nothing Happened." When we got our mail, we received a letter. God had healed his wife. She lived eleven more years and wrote us a letter each month. We continued to pray for her blind husband. Our next trip to the home was a lot more fruitful. God saved souls. We anointed the blind man with oil and prayed. Again the devil lied. Our mail came, and God answered prayer and healed her husband. The Lord Is Always Faithful, and God Is still A Miracle-Working God. We are always astonished at the fact that God is well able to supply what we need, and the Lord is so faithful and always on time. I believe the Lord wants us to have a vision. His word says, "Where there is no vision, the people perish..." (Proverbs 29:18a) Purpose in your heart today to build bigger. Blonnie and I began to pray for a tractor trailer so it would be easier to travel and so we could have more favor with the truck drivers as we identified with them better. As we set up and ministered in the truck stop at Bakersfield, California, we spotted a tractor across the street in front of the Kenworth Dealer. I called Blonnie, and we walked across the street and laid hands on the tractor we liked and began to pray. As we were praying a salesman came out. We told him we had come to pray down a tractor like his. He laughed and made fun and talked about the "real world" as he called it. He mentioned 30, 40, 50 and 60 thousand dollars a piece, but I served notice on him that God is able, that God is a MIRACLE-WORKING GOD, and that HE would supply the tractor and trailer we needed to preach HIS Word. Less than three months passed. A driver came on the Mobile Chapel and said, "We have been watching you. God has laid it on our hearts to buy you a tractor, if you will receive it in Jesus' Name." How we praise God for the Kenworth tractor. It is anointed to carry the Gospel of Jesus. It is exactly like the tractor we prayed over in Bakersfield, California. except it had a Cummings motor instead of a Detroit. That is exactly the way we prayed. God surely worked a miracle in supplying the tractor and trailer. We named her "Sheneeda" because she needs a lot of love. We are still using this 1962 model Kenworth tractor, twenty years later. Now God has supplied a 1990 model Kenworth tractor and a beautiful, stainless steel, Great Dane trailer. Pray for us as we build bigger for our God. It is surely wonderful to truck for a Miracle-Working God!! God Is Faithful, Even on Radio and T.V. We are now in our twenty-third year of trucking for Jesus. [Web assistant's note: This was written around 1997 or 98. The Gregorys began in 1975.] It has been a wonderful trip. My wife says, "A funny thing happened on the way to heaven." It has been glorious fun, and the Lord truly is a MIRACLE-WORKING GOD, WHO IS SURELY CONCERNED ABOUT OUR EVERY NEED. God has blessed us to meet good people from all over the world. The Lord is good. In 1986, in the month of December, God sent a prophet to me. He had a message about expanding the Trucking For Jesus Ministry. The prophet talked about radio, T.V. and said God would open doors in home missions work. The message was a hard message to receive, but the good Lord sent confirmation to us. As we prayed, God opened doors and made opportunities for us. Praise His Wonderful Name. God supplied radio time. We have already been on radio for more than ten and one-half years now. The Lord has blessed this radio time, and many lives have been changed. The door is now open for T.V. time, and the programs are being received in many areas of our country. The Lord Is Always Faithful. His mercies endure forever. God is still a MIRACLE-WORKING GOD AND WANTS TO WORK A MIRACLE IN YOUR LIFE AND YOUR FAMILY. IF YOU ARE NOT A CHRISTIAN, I beg you to accept Jesus today. The Word says if you believe the resurrection took place, and believe it with all your heart and confess Jesus with your mouth, the Bible says you will be saved!! Please! Make a decision for Jesus. It is the most important decision you will ever make. Jesus is life. Choose life. (John 14:6) Fail to choose Jesus and it will be torment in Hell forever. 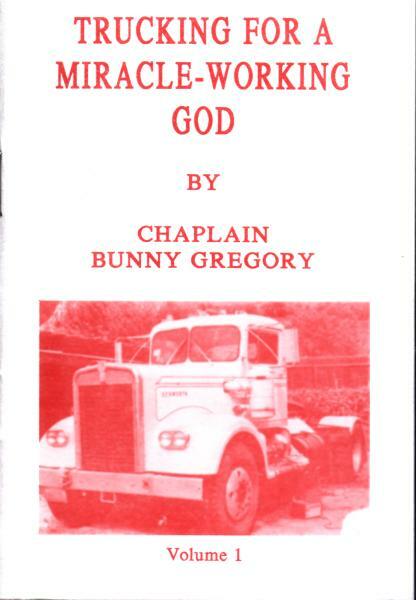 [We hope you have enjoyed this booklet of Chaplain Bunny Gregory's that has been converted into a web publication.